What's the difference, if anything, between wireless and radio? The early wireless experiments achieved remarkable results but did not use radio waves. It wasn't until Heinrich Hertz performed his famous experiment in 1888 that the existence of the electromagnetic spectrum was confirmed and radio (or wireless), as we know it today, became possible. 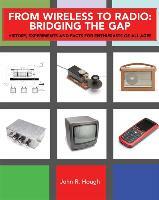 "From Wireless to Radio: Bridging the Gap" repeats some of the early wireless and radio experiments using modern, low-power components. As the book progresses, the theory and history behind them is explored. The experiments involve a limited amount of circuit construction and allow enthusiasts aged thirteen and above to share the sense of achievement experienced originally by the wireless pioneers of old. Voice communications can be established across the kitchen, garden or school playing field using simple circuits running off nine volt batteries. No licence is needed as no radio waves are transmitted. The wheel has now come full circle and the term wireless is used to describe almost any means of communication without wires. "Wireless" systems from door-bells to computer interfaces are all around us. This book provides an insight into how these modern systems work.